On a typical cool Bay Area summer morning, the CyArk team made its way to the Presidio of San Francisco to capture some of the oldest walls ever built in the city. At the heart of the Presidio, these walls make up the structure called the Officers' Club. 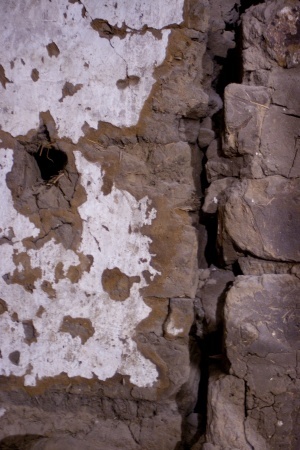 After the original adobe walls were built by the Spanish colonists in 1815, they went into hiding starting in the 1880's when a new layer of wood was added. Thanks to the work being conducted by the Presidio Trust and its Archeology Lab on site, we can learn exactly what these adobe walls looked like, and how subsequent occupiers added layers of new materials to accommodate changes in use. The uncovering of these walls is also serving an important need to repair the damage they have incurred over the last two centuries. Work is being completed in stages, with the current room uncovered being the De Anza Room. 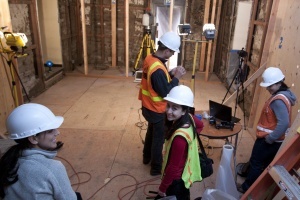 The uncovering and repair of the original adobe walls is part of a larger project to rehabilitate the Officers' Club and create a state-of-the-art facility for the Archaoology Lab to welcome visitors and host educational events. The CyArk team met with the Archaeology Lab's Geographic Information Specialist, Hans Barnaal, as well as two of the Lab's interns, Chris Albon and Juliana Fernandez to access the De Anza room and begin the scanning. 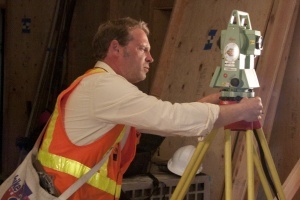 The two teams worked together to capture several scans of the interior which will be tied to the site's existing Survey Control Network. This collaborative effort will ensure the integration of the new data collected not only with CyArk's, but also the Archaeology Lab's existing documentation of the building. Within the next few months, CyArk will return to the Presidio to scan two additional interiors, the Mesa Room and the Moraga Room. Scan data showing the adobe walls below wood framing which was added later. A detail photograph of the area near the left corner is shown at right.